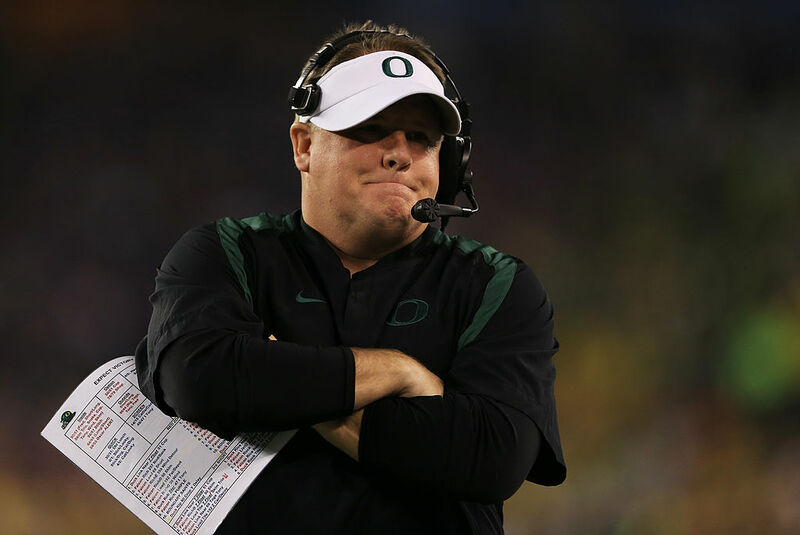 Oregon and Chip Kelly were a match made in heaven once upon a time. But, just four years later, Oregon has an opening for a new head coach and Chip Kelly’s time in the NFL has been an utter failure. Perhaps the band could get back together for it’s last “reunion tour” ever? Naturally, speculation would be that Kelly would walk back with his tail between his legs and head the Ducks program once again. We can all stop with that speculation right now according to Kelly himself during his Wednesday press conference. Of course, the media wasn’t done asking the same question multiple ways. So, Kelly tried to answer it another way too. The media wasn’t taking the bait, and asked if there was any chance of him being the next Oregon coach. Alrighty then…we give in, Coach Kelly. We get it, you love the NFL and you want to succeed. There’s just one problem — you’ve been an abject failure as a NFL head coach. Something about a 1-10 record this season and just one playoff berth in four years in the league screams “failure” in NFL terms. So does a mediocre 26-21 record in nearly four years since leaving Oregon. Even if Kelly is saying he isn’t leaving for Oregon, the opening ironically gives him a lot of leverage in figuring out his NFL future. We’re sure he can land on his feet in college football should the 49ers want to get rid of him, but Kelly is smart enough to let the 49ers be the ones to decide, rather than him being seen as a “quitter” before this season ends. Burning bridges is never a good idea, and neither is being so stubborn to realize that you can go from failure to success rather quickly. Just ask Nick Saban and his transition back from college to the NFL. You don’t think Kelly could do the same? Then again, Oregon may not have much time before it needs to make a call for a new head coach. With the recruiting dead period coming up on December 12, the Ducks need some direction and Kelly likely won’t have the decision from the 49ers before then. So, take your money off Kelly and put it on a name already in college football if you’re inclined to bet on how this plays itself out.